The additions in this color "green may include (name, SURNAME, middle name, age and birth date)"
Georgia was the 4th state in the USA; it was admitted on January 2, 1788. 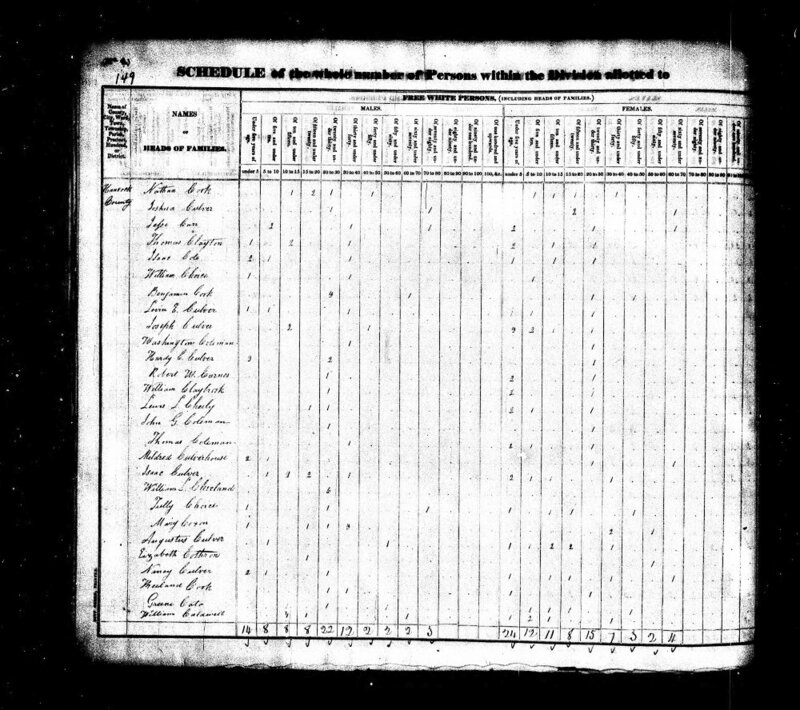 1830 Harris County, Georgia - Schedule of the whole number of persons whithin the division allotted to Wm. F.
Name, P, U.L., gl, P.L., No., Dist., Co., Towns, Vl., P.N., Dols., Cts. 1 20 20 John NANCE, 16, M, South Carolina? District: District 1070 W. M. NANCE 1 Poll, 1 person subject to military duty, 160 2d quality acres, 160 3rd quality acres, Aggregate value of land 2000 Dolls. District: District 152 G. W. Ray Ag. Sarah NANCE 5 Slaves, Aggregate value of slaves 2000 Dolls. 4 444 449 Henry MOSS, 43, M, Rail Rd. Track-man, 450, 4000, Hanover Germany?? Whitfield District John NANCE 1 Poll, 3 children between 8-18, 40 3rd quality acres, 40 total acres, District 13, Section 3, 300 Dolls. District: Mount Ville W. J. NANCE 1 Poll, 4 children between 8-18, 300 3rd quality acres, 300 total acres, 1000 Dolls. District: Mountville W. J. NANCE 1 Poll, 4 children between 8-18, 300 3rd quality acres, 300 total acres, 1,800 Dolls. District: Mountville W. J. NANCE 1 Polls of colored person, 30 sheep, 1 child between 6-18, 1 blind person, 18 year old male, 2 workers 12-65, 303 acres, District 7, 1212 Dolls. McCrary district Geo. NANCE 1 poll, Tax on Poll 1.00 Dolls. 172 district W. F. NANCE and wife 4 work hands, 117 acres, Value of lands 351 Dolls. Pg. 526 Shoal Creek Dist. M593 174 67 Florence P. O.
M593 181 58 Barnett P. O.
Joseph NANCE, 6/12, M, W, At Home, GA, Nov.
Jamestown, Page: 782A; Enumeration District: 10; Image: 0306. District 9, Page: 317B; Enumeration District: 46; Image: 0006. 10 70 20 . . 111 113 Isaac COPELAND B M 25 . . . / . . Turpentine Hand / . . . . . . . / / Va Va Va .
11 70 20 . . 111 113 Lavinia COPELAND B F 23 . Wife . / . . Keeping House . . . . . . . . / / SC SC SC . 12 70 20 . . 111 113 Casswell COPELAND B M 8 . Son . Ga Va SC . 13 70 20 . . 111 113 Alleck COPELAND B M 2 . Son . Ga Va SC . 14 70 20 . . 111 113 Timothy COPELAND B M 4/12 Jan Son . . . . . . . . . . . . . . . Ga Va SC . 38 Wade H NANCE, Head, M, -, Single, Anderson Co. L.C.